We are having the coldest weather in two years according to the local meteorologists. Cold weather like this calls for a great comfort food dish like this one. Creamy pasta with a kick. I tossed in some smoked turkey sausage that I had on hand and served it with a salad and breadsticks. It was delicious! Heat olive oil in a large skillet over medium heat. Add onion and saute for two minutes. Add garlic and cook for an additional 30 seconds or until fragrant. Meanwhile, boil pasta and cook until al dente. Stir in Cajun seasoning and tomato paste. Add half and half and milk. Bring to a boil and then reduce heat to low. Add in sausage. Drain pasta and add to skillet. Top with chopped onions. Enjoy! 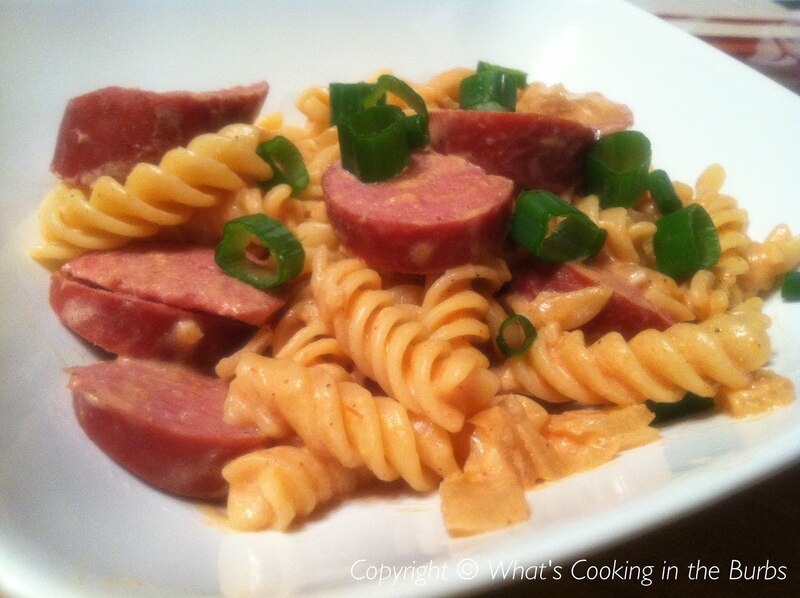 I love this twist on regular pasta bring it by foodie friday today.